On this date in time, February 2, 1949, professional golfer Ben Hogan survived a near fatal automobile accident in a head-on collision with a Greyhound bus. Hogan, one of the greatest golfers of all time, suffered a double pelvic fracture, a fractured collarbone, a chipped rib, a broken left ankle, and near fatal blood clots. The 36 year old golfer remained in the hospital for nearly three months before being released with his golfing future very much in doubt. 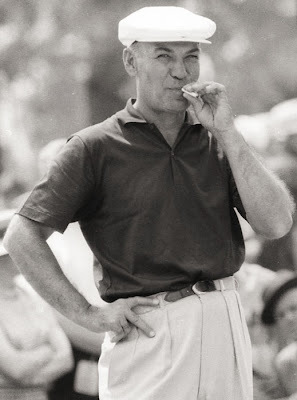 However, Hogan returned to the course only eleven months after his ordeal and went on to win six of his nine majors (T4th best all-time) following the accident. He also came out of his accident as a more popular and 'approachable' golfer with the galleries and fans. The 5'7" Hogan, know as "Bantam Ben", is famously recognized for his theory of the golf swing, as well as, his tremendous ball-striking ability.